“The Grand Palladium Imbassai Resort & Spa is located within the Imbassaí nature reserve, alongside the sea of “Costa dos Coqueiros” and home to the river that gives it its name. The resort’s extensive pristine beaches, dunes and protected environment make it a truly unique setting for a vacation, wedding or event. Only a 10 minute walk from Imbassaí, near the village of Praia Do Forte and about 45 minutes from the airport of Salvador, the resort’s design reflects a perfect harmony between modern and luxurious facilities of a first class resort and the beautiful, natural environment of coconut groves and rivers that make up the “Green Line” coast of the region. Palladium Hotels & Resorts offers all the facilities and services for a memorable stay: 24 hour reception service, express check-out, ATM machine, wake up service, handicap facilities, money exchange, laundry service*, ice machines, Internet café*, WIFI Internet access in the lobby. The 5-star, all-inclusive Resort of Grand Palladium Imbassai Resort & Spa in the perfect setting to relax in its superb facilities, consisting of 654 Junior suites, 3 buffet restaurants, 3 themed restaurants, 13 bars, a fantastic Spa, children’s play area, Mini Club and Teens Club plus any number of things to do that will make your stay unforgettable. 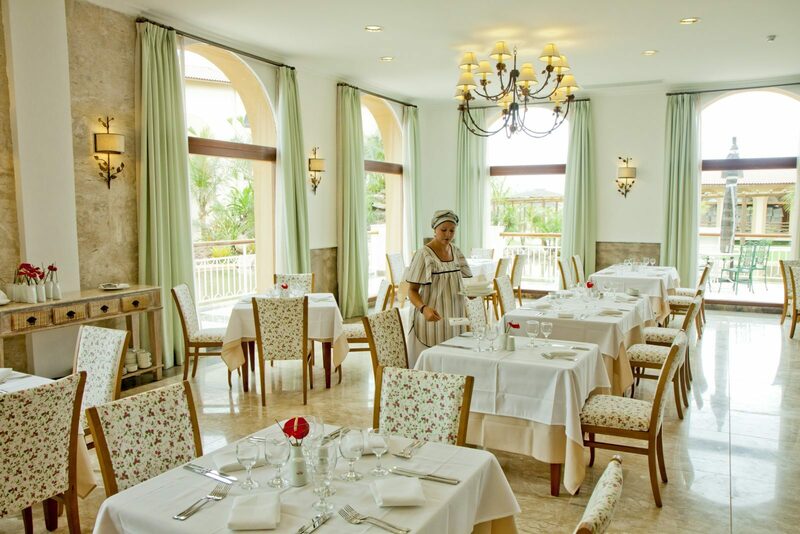 The Grand Palladium Imbassai Resort & Spa features 654 Junior Suites, distributed in 11 villas of 3 floors, in buildings of different sizes; 66 adjoining Rooms, 10 of them adapted for disabled people which are located around the main pool. Jr. Suites : All rooms have a king size bed or 2 double beds, fully equipped bathroom with shower and hydro=massage bathtub, bathrobes & slippers, hairdryer, air conditioning, minibar, 32′ flat screen TV, Ipod station, internet connection(additional charge), sitting area with sofa bed and a balcony. VIP Junior Suite (Adult Only ) : Share a unique experience in an elegant adults-only bedroom that features a queen-size bed, a ceiling fan, air conditioning, a hairdryer, a VIP minibar with water replenished daily, a flat-screen TV and a radio-alarm clock with an MP3 player. Each Junior Suite has a balcony or a terrace with a small table and two chairs, from whence to enjoy the beautiful views. The Grand Palladium Hotel Group prides itself in making it possible for everyone to enjoy their vacations. Weather you are a couple, a group or a family the Grand Palladium Imbassai has something for everyone. If you or someone you are travelling with has any food allergies or special requirements your needs will be looked after. 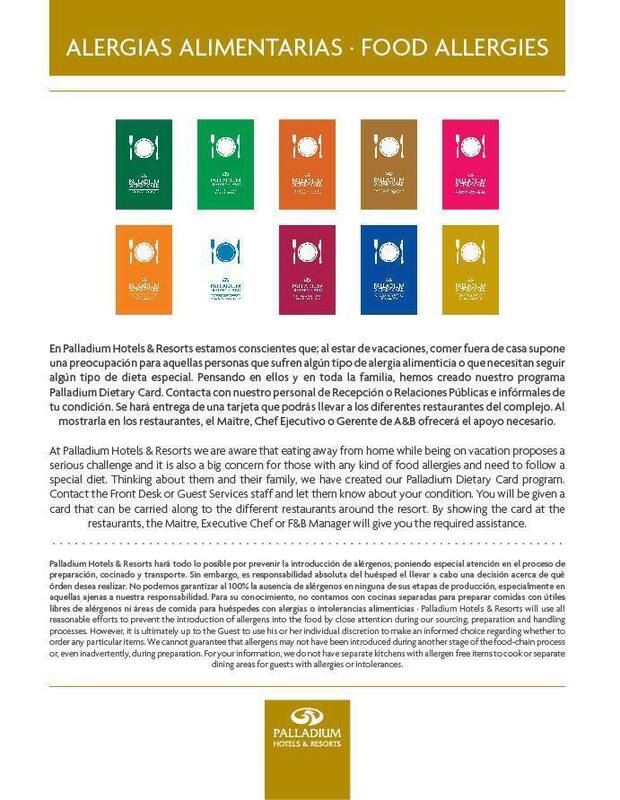 You can learn more about the Grand Palladium’s food allergy program in this short article and by watching this very informative video all about the program and the resorts accessibility. Prepared by Anne & Brenda, Managers,Unofficial Palladium. 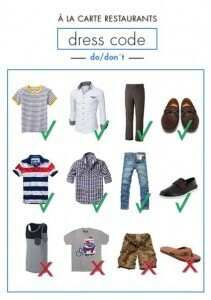 We hope you will find this useful when trying to decide what to pack/wear if in doubt. While everyone will have their own thoughts on this, good common sense will go a long way. Breakfast is usually eaten at a buffet. Please wear shorts & T shirt, or many wear a bathing suit with a coverup. Foot wear required. Beach bars: Bathing suits OK. Please wear ftip flops or sandals. Restaurants located near main pools : Bathing suits with cover ups OK.Men please wear a T shirt.All need foot wear. Indoor Lunch Buffets : DRY bathing suit with coverup. No tank tops for men. Foot wear. Buffets: For men & women: shorts & t shirts OK Footwear. No tank tops. No running shorts or beach wear. 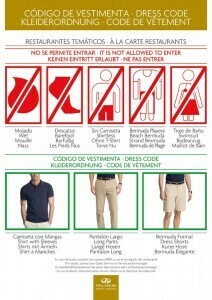 A la Cartes: There is a dress code for men. Not for women which is unfortunate as many young women overlook any code of decorum by wearing very short, torn denim shorts etc. 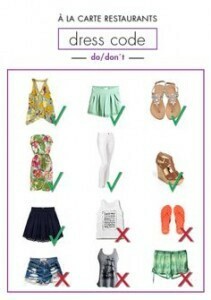 Most of us enjoy dressing up a bit in a sundress or nice capris. Men please do not wear cargo shorts. A la Carte’s : formal pants, long or short and shirts with sleeves. Dress code for buffets : casual attire, must not be wet. Foot wear is required at all dining facilities including the Pool side restaurants. Oxum, the pool buffet is a beautiful open air restaurant located next to the main pool with a splendid view. Features an Italian and Bahiano corner show cooking. Serves continental breakfast at 10:30 am and lunch from 12 pm to 4 pm. At 4:15 sandwiches and snacks are served until 6 pm. Entre Aguas, the beach buffet is open from 12 pm to 4 pm it features a fresh grilled selection of fresh fish and a variety of meats. (grill operates until 3 pm). The typical Bahian snacks and variety of salads and deserts offered for your enjoyment while dining near the river Imbassai, will make your meal unforgettable. 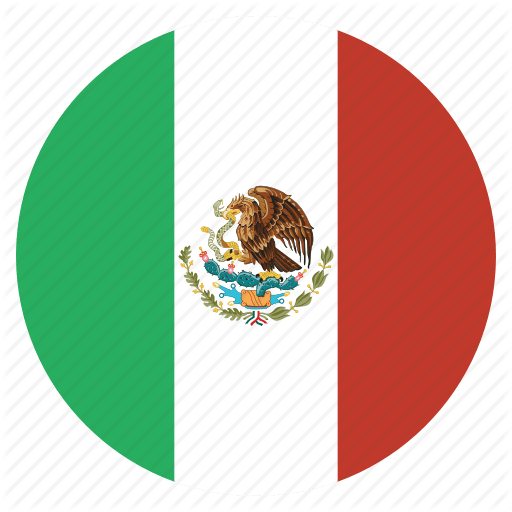 The number of visits to a la carte restaurants is unlimited. Reservations needed for a la carte restaurants. 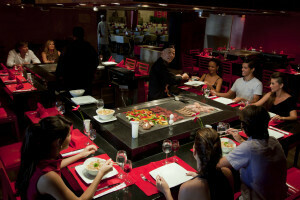 Japanese and Teppanyaki, two different areas with separate menus located within the same restaurant. 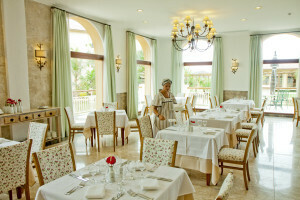 Saturday Is Paella day at The Grand Palladium Imbassai. Location : On the beach at 12:00, just in time for lunch ! Bar “Dunas” on the beach with chill out area and Balinese beds to enjoy music and sunsets. Disco Bar “Ouro da Bahía “- from 11.00 pm to 02.00 am, A/C. Bar” A Bosa Nova”- Reading and musical lounge with tables. No smokers, A/C. Sport Bar “Maracana” with snacks (6 pm to 7 am), games and night service – from 11.00 pm to 7.00 am. No alcoholic drinks, except for beer. Extra bar at the theme restaurants. The serving of alcoholic beverages to minors under the age of 18 is prohibited. The opening hours of the bars and restaurants may change according to season. 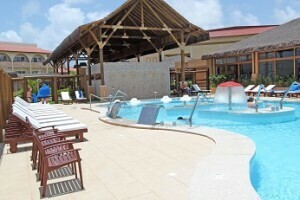 $10 USD per person per day for access to the hydrotherapy facilities wet areas of Zentropia Spa and Wellness. The Grand Palladium Imbassaí Resort & Spa offers its guests a spectacular and modern Spa with a wide range of therapies such as massage, body treatments and facials and peels. Our Spa features a beauty salon where we offer waxing services, manicures, pedicures and unisex hair salon attended by top professionals. ALL INCLUSIVE: Fitness area with large gymnasium, aerobic room, spinning room, all with lockers and locker room all with air conditioning. WITH EXTRA CHARGE: Hair salon, massages and various beauty treatments. Wet area with swimming pool with a river and incorporated Jacuzzis, sauna, steam bath, Jacuzzi, different sensation and foot showers. Baby Club – Open from 09:00 to 20:00 hrs. For children from 1 to 3 years. Mini Club – Open from 09:00 to 22:00 hrs. For children from 4 to 12. Teen Club- Located nearly Sports Facilities Area. Open from 10:00 am to 04:00 pm. For youth 13 to 18 years. Palladium Hotel Group only markets the Grand Palladium Imbassaí Resort & Spa directly on its website (www.palladiumhotelgroup.com) and its Call Center whose telephone numbers are featured on the website. The Resort can also be booked through leading renowned tour operators and travel agencies. The Group does not recommend booking the Resort on any other websites that have the Group’s or Resort’s logo, such as www.grandpalladiumimbassai.com.br. Bookings on these websites cannot be guaranteed. 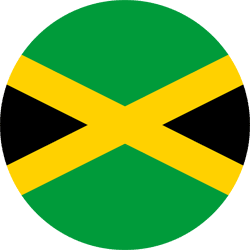 If you have any questions about your upcoming trip please visit our FORUM to ask.